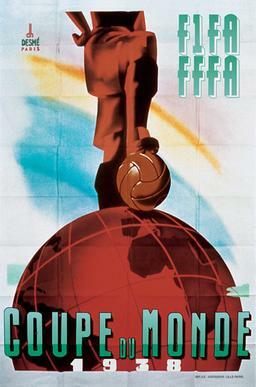 The third FIFA World Cup TM was hosted by France. Despite the imminent threat of War in Europe, France was chosen over a South American country. Argentina protested then boycotted the tournament as did Uruguay. Spain was forced to withdraw because of the Spanish Civil War. Austria (Wunderteam ) qualified for the World Cup, but after qualification was complete, the Anschluss united Austria with Germany. Austria had no team of their own and subsequently withdrew from the tournament, with some Austrian players joining the German squad. 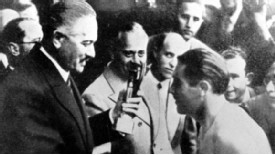 FIFA Secretary, Dr. Ivo Schricker invited England to join the competition, but Sir Stanley Rous, declined. With Austria's place empty, Sweden, progressed directly to the second-round by default. 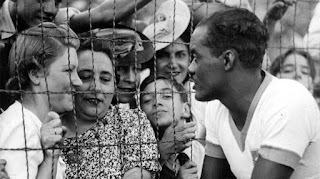 Cuba and the Dutch East Indies came to France. 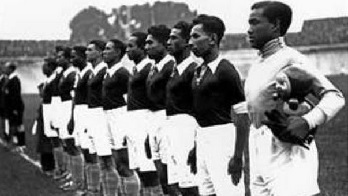 For the first time, the title holders and the host country were given automatic qualification and the 1938 FIFA World Cup TM tournament started with only 15 finalists. 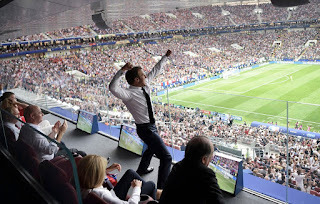 France, the host country and Italy the previous champions, both automatically qualified leaving the victorious form the preliminary rounds. Eleven spots were allocated to Europe (Austria, Belgium, Czechoslovakia, Germany, Hungary, Netherlands, Norway, Poland, Romania, Sweden and Switzerland) , two to the Americas (Brazil and Cuba), and one to Asia (Dutch East Indies). This was the smallest ever number of teams from outside the host continent to compete at a FIFA World Cup TM. Sixteen teams should have participated but Austria, withdrew. 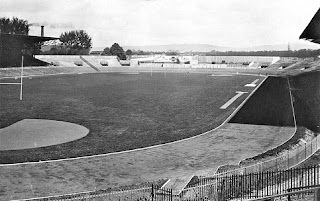 Ten cities were allocated, although only nine were used during the tournament (Paris - Stade Olympique de Colombes and Parc des Princes , Marseille - Stade Vélodrome, Toulouse - Stade Chapou , Bordeaux - Parc Lescure , Strasbourg - Stade de la Meinau, Le Havre - Stade Municipal, Reims - Vélodrome Municipal , Lille - Stade Victor Boucquey , Antibes - Stade du Fort Carré, and Lyon - Stade Gerland) but Lyon, was never used. Germany, France, Italy, Czechoslovakia, Hungary, Cuba and Brazil were seeded for the draw and Sweden was given a bye due to Austria’s withdrawal. If a match was tied after 90 minutes, then 30 minutes of extra time were played. When the score was still tied after extra time, the match would be replayed. 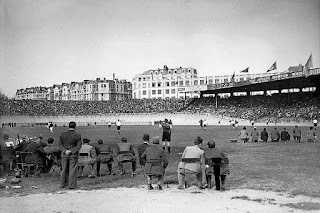 In the opening game held at the Parc des Princes, Paris, Germany drew 1 - 1 with Switzerland. Ernest Willimowski (Poland) became the first player to score four goals in a World Cup game during Poland's 6–5 loss against Brazil. 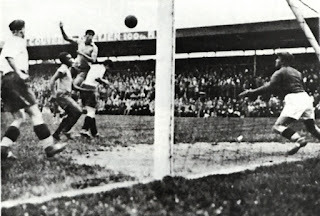 Leônidas da Silva (Brazil) was the top scorer with 7 goals. In total, 84 goals were scored by 42 different players, with two of them credited as own goals. A total of 483,000 people attended the 1938 FIFA World Cup TM with an average of 26,833 per game. The final was held at the Stade Olympique de Colombes in Paris and Italy beat Hungary 4-2 to be crowned World Cup winners for a second time. This was the last World Cup match for twelve years.